Blog Which day is the best to send out emails? Which day is the best to send out emails? Which day in a week is the best to send out emails? As I interacted with more and more customers I found everybody has a theory. Some customers say it’s Monday because people start to read emails; some customers say Monday is the worst because people already have too many emails to read, in fact Tuesday or Wednesday is the best. Some customers prefer mid-week such as Thursdays. Some customers – even though very few – argue that weekends are the best because the hard working professors and students will likely to open their newsletters since not many marketing emails are sent in weekends. We decide to find out. In June 2013 we sent out identical newsletters to each of the 7 randomly divided groups on each day in a week. Each group contains 2000-4000 recipients. What are the click/open rate? Which day is the best to send emails? 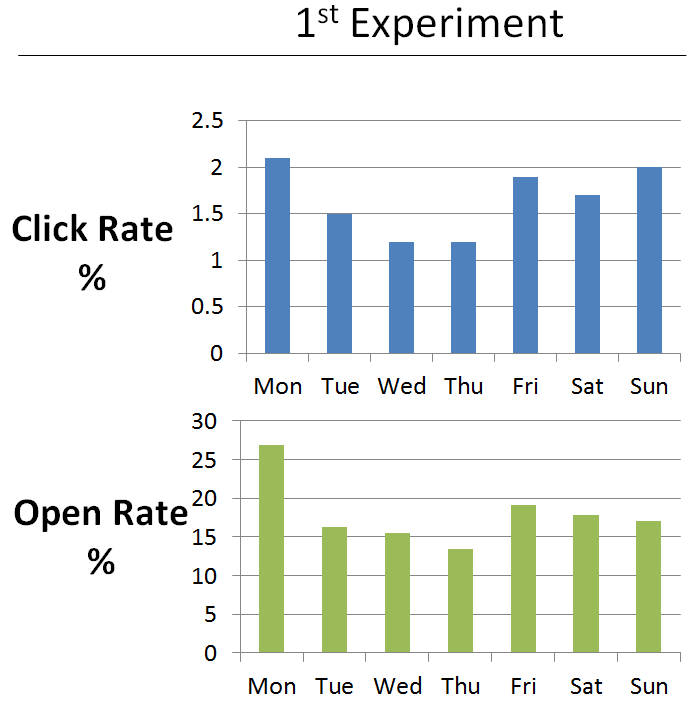 In terms of the click rate, Tuesday to Thursday are worse than Monday, Friday, Saturday and Sunday. So it’s not bad to send out emails in weekends. In terms of the open rate, Monday is clearly the winner. Every scientific experiment needs repetition, right? So we repeat the above experiment in October 2013. Here is the result. 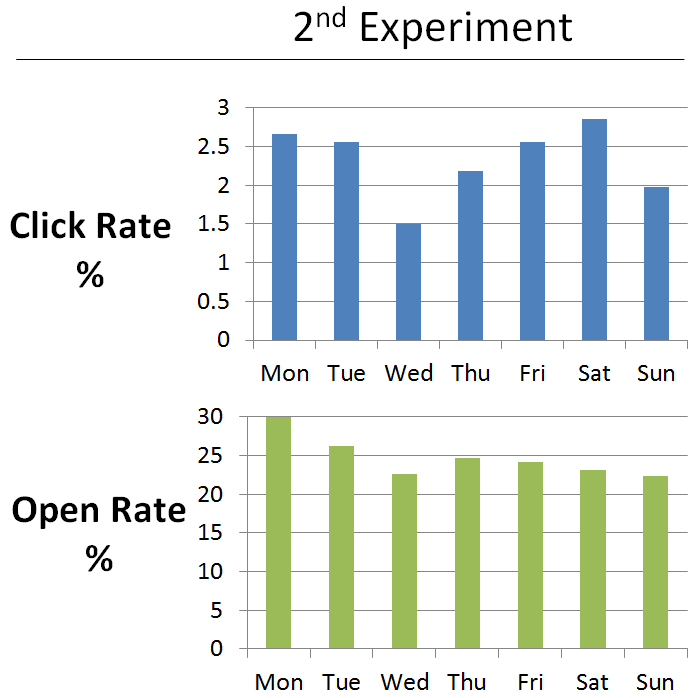 We roughly reproduced the same result: Monday is best in open rate, and mid-week is worse in click rate. So which day are you going to send out your next newsletter? If you want to maximize the open rate, Monday is the best. If you want to maximize the click rate, Monday, Friday, and Saturday are the best. Note: You may also want to check out What time in a day is the best to send out emails? Thanks Xu for sharing this article, very interesting. Looking forward to more like this. I am wondering if it’s possible to specify it by industry or position, so we can decide which day to send email to which person, lol… Just guessing. I have shared it with my LinkedIn connections, it’s a good one. Thank you, Jo. The recipients in these experiments are researchers in bio/med space. I imagine that the best sending date may vary for other industries or positions. Maybe in the future we can do similar experiments.